Private Beach, 9 acres of privacy! Amazing Ocean views, a Maine lovers retreat! Beautiful Custom Home Overlooking Canada - Like living in a painting! This newer home sits on cliffs overlooking Canada. Watch whales, bald eagles, sailboats, lobster fishermen, and deer from your multiple porches! 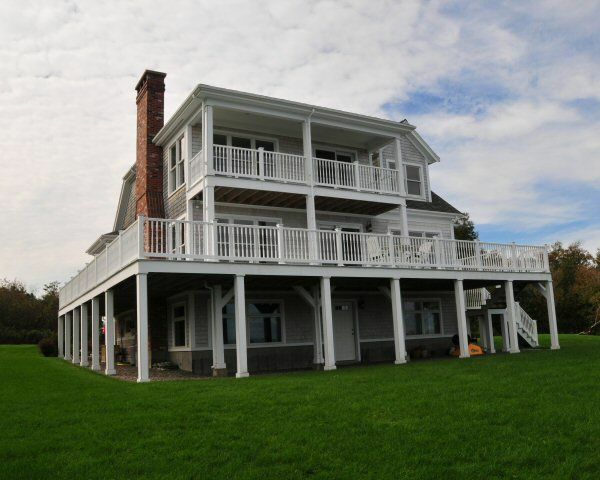 Home sits on over 9 acres of private grounds and includes a private walk-way onto over 1/2 of a mile of private beach. Beautifully furnished, fireplace, and office set up if needed. 4 bedroom plus one suite & 3 bath, sleeps 12, please no pets. Wrap around decks on on second and third stories provide panoramic views of the ocean. A truly magnificent home!!!! All other months at $2,000 per week. May entertain weekend rental if corresponds with blocked dates. Beautiful home overlooking ocean bay views. Spectacular sunrises, bald eagles, porpoise and whale watching all from the back deck. Great day trips into Canada as well as local US islands including Roosevelts Campobello Island. Owners are very accommodating and made our stay very enjoyable. The house is well-maintained, comfortable, spacious, and nicely-furnished, but the real charms were the number of large windows affording the opportunity to see panoramic views of the ocean all day (and the occasional bald or golden eagle passing the house); and the cozy, living room fireplace for evening conversations over glasses of wine. The house is within 5 - 20 minutes drive to a number of beautiful walks/hikes (e.g. Shakford, Sipayik, and Reversing Falls) and the shoreline below the house is littered with shells and sea urchin skeletons (our 2 yrs old son loved this). We had a wonderful, relaxing time with family; exploring, cooking, talking, laughing, and playing. We would definitely recommend the property as it was the nicest we have stayed at in our 5 trips to Eastport over the years. This was one of our best vacations ever! The views from the property are absolutely stunning. We saw whales, seals and porpoise in the water almost everyday. There is plenty of space to stretch out and the environment is so relaxing. The town of Eastport is small but so very charming. We fell in love and definitely plan to return. This place was amazing! To overlook the ocean with such commanding views in such a beatiful, modern home with direct access to hundreds of feet of beachfront made for one of the most comfortable, relaxing vacations my family has ever had. The value alone was crazy good - you can't find this quality and value anywhere that I've ever seen, and we have traveled extensively. The local culture and super fresh seafood was icing on the cake. I've never eaten so much fresh caught lobster and haddock in a week in my life. Loved it!!! This beautiful home was a perfect holiday retreat for my family this year. The many large windows allowed for amazing views of the sunrise in the morning, while the expansive grounds were great for exploring the beaches and forest. Even though the temperature plummeted and we had several large snowstorms, the house stayed very warm and snug throughout our stay. I would highly recommend this property and plan to return in the future!